(TibetanReview.net, Oct03, 2018) – China is demanding an apology from the UK after one of its state TV journalists hackled a fringe event organized by the ruling Conservative party’s Human Rights Committee and then repeatedly slapped a party activist who asked her to leave for shouting at one of the speakers, accusing him of being anti-China, reported the AFP Oct 2. The report said police in Birmingham, central England, where the conference was taking place, said a 48-year-old woman was held in custody overnight after being arrested on suspicion of common assault. The report cited Mr Enoch Lieu, a party activist helping at the event, as saying the China Central Television (CCTV) reporter slapped him twice after he had asked her to leave for shouting at one of the speakers and accusing him of being anti-China. “I stood in front of her and said can you please go, trying to show her the way out. Then out of the blue she slapped me in the face,” the 24-year-old, who was born in Hong Kong but schooled in Britain, was quoted as saying. She continued to slap him as he continued to ask her to leave and the incident was only resolved when police arrived, the report said. The victim has called the slapping an absolute assault on British democracy, right in the middle of the Conservative party conference. However, the Chinese embassy chose to look at the development differently and posted on its website in English a claim that her ejection was “completely unacceptable”. “In a country that boasts freedom of speech, it is puzzling that the Chinese journalist should encounter obstruction in such a way and even assault at the fringe event when she simply raised a question and expressed her opinions,” the posting was quoted as saying. 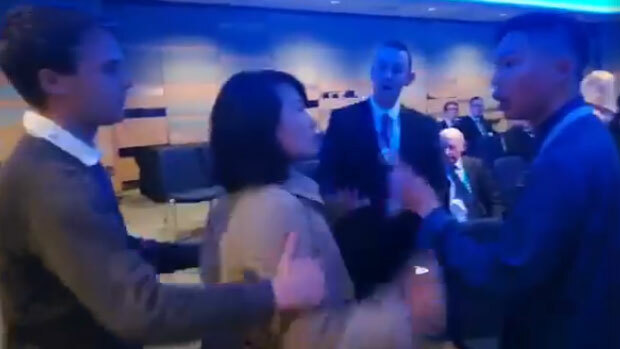 Chinese state broadcaster CGTN was quoted as saying in a statement that China Central Television reporter Kong Linlin “was blocked and assaulted when she raised a question and expressed her opinion”. It was stated to have quoted a CCTV spokesman as saying it was “unacceptable” and to have called for an apology from organisers, urging British police to “protect her legitimate rights”. The event was stated to have featured Hong Kong pro-democracy leaders Martin Lee, Nathan Law and Benny Tai, as well as British MP Fiona Bruce and campaigner Benedict Rogers.